I try not to post my family vacation videos or talk to too personally here on the Mission Repair blog, but I’m just going to break a few rules today 😉 After all, it’s what I feel like writing about this morning! My son Casey turned 18 years old yesterday. 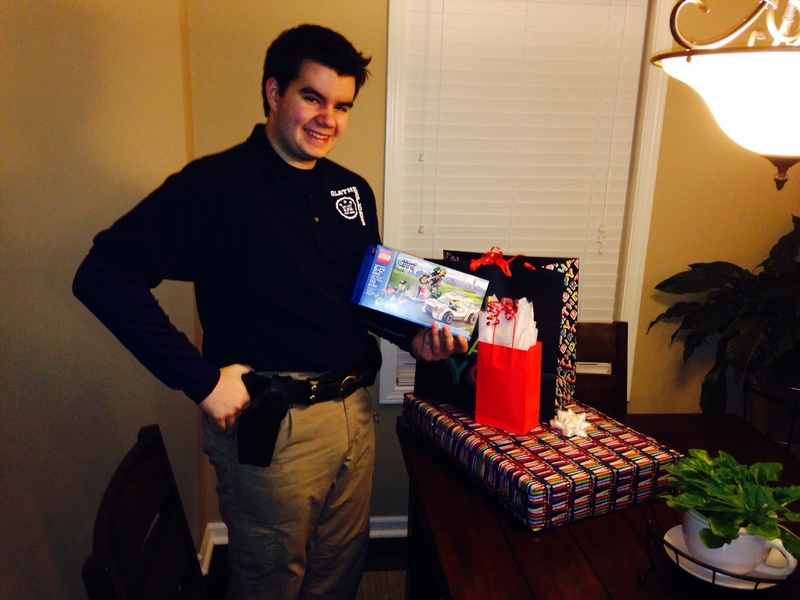 Here he is as he arrived home from his Police Explorer program last night, and we surprised him with a few gifts. Of course, he’s holding up his Lego “Police Car” that he received at the PD station in his group. The fun part about this birthday was a little about me, because I’ve been saving several items from BEFORE he was born, through his birth, and a few years into his life, and put them all into his “Time Capsule” that I’ve been hiding for 18 years. So we cracked it open last night and found all of the goodies that brought back a ton of memories and gave him some insight as to what I was thinking and doing around the time he was born in 1997. I had a couple of newspapers saved in there headlining Princess Diana’s accident (yup, that was 1997, 18 years ago, wow), some old coins from the early 1900’s that I’ve been saving, some memorabilia from my grandfather from WWII, and several other personal items and pictures for us to talk about. For all the parents out there: I highly recommend the “time capsule” if you have the option. It worked out great! OK, back to work for me. If you saw my blog post from last night, you know that I’m heading out to Denver today after dinner. Here’s to a new chapter in Casey’s life, and at Mission Repair. A lot is happening right now! This entry was posted in casey arter, ipad repair denver, iphone repair denver and tagged Casey Arter, iPad Repair, iphone repair, mission repair locations, missionrepair.com, ryan arter. Bookmark the permalink. ← Mile high- here we come!